77 Greenwich Street is already at its fourth floor, and now, a new teaser website for the 500-foot, 42-story residential tower has launched, accompanied by fresh renderings. 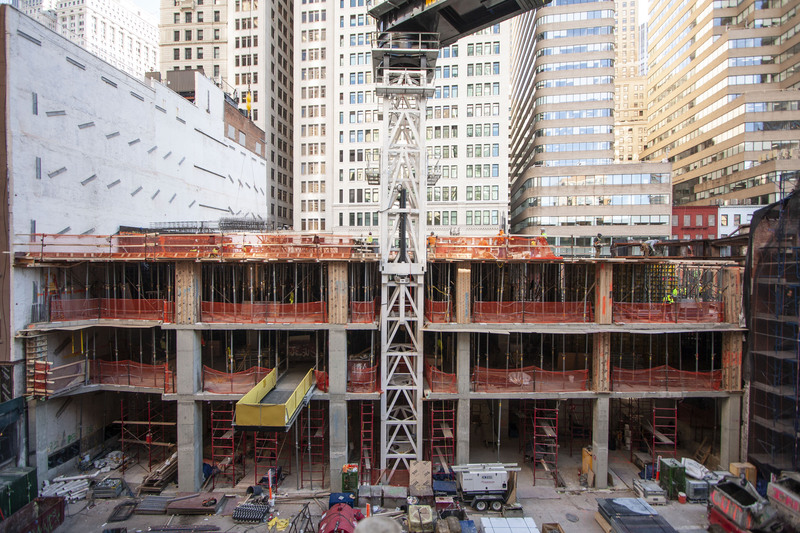 Trinity Place Holdings is developing the ground-up Financial District project, with FXCollaborative serving as the architect. The podium will eventually house a grade school and retail space. Interiors are being designed by Deborah Berke Partners, the same firm who helmed interiors for 432 Park Avenue. The photo above, taken by Will Femia, shows recent progress on the site, with the formwork progressing vertically up the podium. 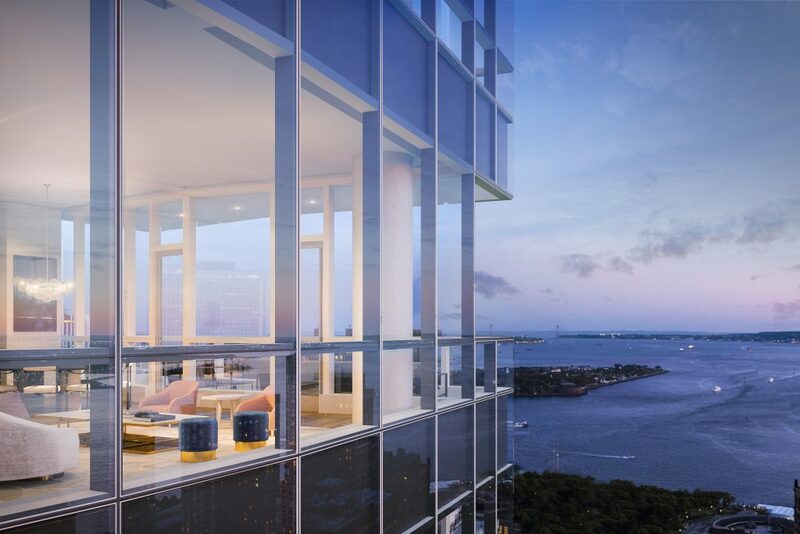 90 residential units will start 150 feet above the street, to allow residents optimal views of the Hudson River and the rest of the Financial District. Units will range from one- to four-bedroom spreads with prices to be announced. A pleated pattern of glass will cover the facade, contrasting the neighboring brick and stone buildings that have traditionally made up the identity of Financial District since its inception as New Amsterdam. However, like many of its neighbors, 77 Greenwich will have a slender profile, running north to south due to the rectangular shape of the property and required setbacks on the east and west sides. On the top of the tower, there will be a residential lounge with a catering kitchen, a children’s playroom and a double-height fitness center. Sitting on the other side of the glass are two outdoor rooftop terraces looking east towards Wall Street and west towards Jersey City and the Hudson River. They also will come with outdoor barbecue grills. Another terrace is found on the top of the podium’s ninth floor that comes with a dog run, dining areas, and pergolas. The preservation and restoration of the Robert & Anne Dickey House is also underway. It is a historic landmark built 208 years ago, and will be incorporated into the new elementary school . It currently stands as a hollow shell held up by large steel beams and girders. Sales of 77 Greenwich Street are expected to launch next Spring, with completion anticipated for 2020. 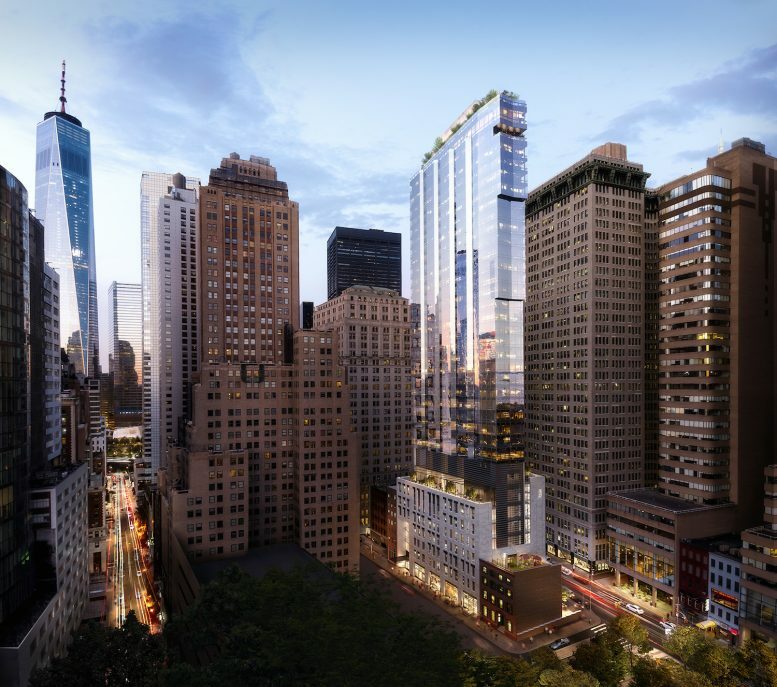 3 Comments on "New Renderings Released As 77 Greenwich Street Begins Climb in The Financial District"
Please pardon me for using your space: Do you like watermelon’s design? This will be the first building you see when you come into Manhattan via the Battery Tunnel – meaning protected harbor views from the building. So many retail stores are vacant. With all the new residential construction we need restaurants, cafes, salons of all types, Blow out bars and upscale convenience stores. Let’s hope businesses see the need and the great opportunity in the new Fidi.